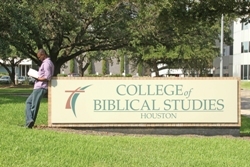 HOUSTON, Texas; Nov. 12, 2015 /Christian Newswire/ -- The Chronicle of Higher Education, reports the College of Biblical Studies has been ranked 6th in lowest tuition in Texas and 3rd lowest for in-state tuition. According to The Chronicle, The College Board has released its annual report on college tuition costs. More than 3,100 colleges and universities were evaluated for the 2015-2016 academic year. Rates represented are before any financial aid or scholarships awarded. At a time when college prices continue to increase while student aid remains unchanged, more and more students are finding it harder to pay for their education. And for many students, this means opting out of college. College of Biblical Studies President, Dr. Bill Blocker credits the mission of the college with keeping rates low. "It's no coincidence that we offer lower tuition rates. We are intentional in providing a high quality, affordable, accredited education. We are here to serve those who are looking for a life transformation." The College Board collected the figures for 2015-16 in its Annual Survey of Colleges 2015. The College of Biblical Studies is one of only five schools in the nation with dual accreditation through the Association of Biblical Higher Education (ABHE) and the Southern Association of Schools and Colleges Commission on Colleges (SACSCOC).